Spider Crossing Sign is animal crossing signs outdoor safety function or indoor decor fun or school spirit at Animal World®. Made of durable lightweight aluminum, this color Spider Crossing Sign measures 17" high x 17" wide has a hole for hanging and is packaged in clear plastic. 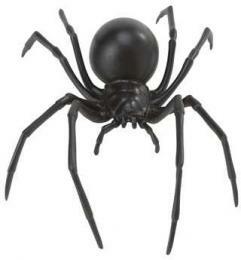 Shop our Spider Gifts Store at Animal World® for our complete selection.